I am so pleased that this event did not land on the Canadian Victoria Day long week-end. In Canada we have a National holiday on the first week-end before May 24 and often the Sandy River Clave occurs on that week-end and I cannot attend because it is a traditional family camping long week-end. I attended in 2014 and 2017 and will be there again this year. Just saw that they added additional information on their website. Looks like they aren’t doing Sunday this year and about 10 less clinics . Who all is going? Can't wait! I see you're a shvingger too! I’m signed up. First time attendee. So how does this work? I’m bringing my waders of course, but I also just got a Beulah Onyx 5124. Can I bring it and demo some different lines and reels on it to see what works best for me? I got a Tonic Switch 400 grain because that’s what Beulah recommended, but I’m new to spey casting and would love to be able to try out other heads, running lines, tips without having to go through several hundred (thousands?) of dollars of line purchases. Can I bring it and demo some different lines and reels on it to see what works best for me?. That’s what this is all about. By all means, bring it! You can demo a few hundred different reel and line combos at The Sandy River Spey Clave. You can also demo hundreds of rods from all the major rod manufactures. 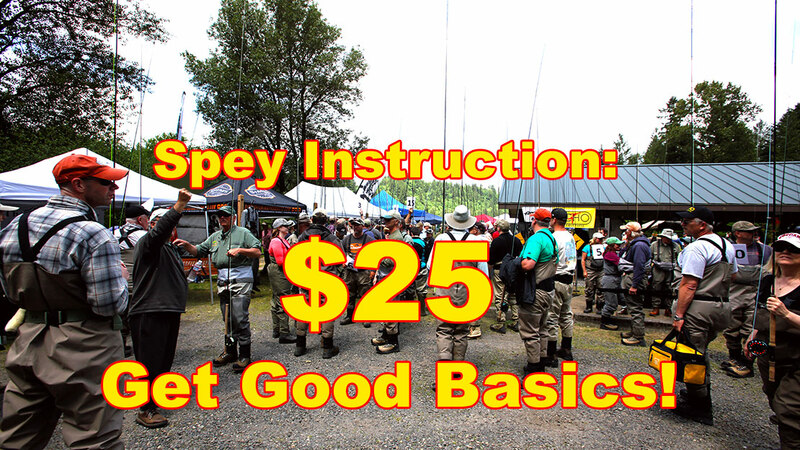 Only 18 days until the 19th annual Sandy River Spey Clave. If you haven't signed up for the 4 hour class, now would be a good time to do so. There are only a few spots left and it's well worth it. Sign up here! Just checked, camp sites still available. perhaps a silly question. While I'm all for hanging out at the clave and learning and all, I also want to be doing some fishing.... what are the options at the time? Trout, etc? The Sandy Clave has been going since Y2K. It started as a brain fart of Fred Evens, helped along by yours truly with the aid of Mark Bachman. We thought we might get a couple dozen spey nuts to show up. About a hundred showed up for that first one. I flew up from L.A. & a couple guys who said they were bringing a motor home & a drift boat volunteered to pick me up @ PDX, put me up for the weekend, and took me fishing, not to mention gave me a lot of pointers on casting.That's the kind of people that come to the Sandy Clave. It grew & became a family reunion where bonds & lifetime friendships were formed. I was there every year for twelve years. The after hours campground camaraderie is legend.